Whether I’m heading out to the dog park for an hour or into the sun for a long hike or swim, I’m grateful to have so many options available for nontoxic sunscreen. Gone are the days when you have to look like a pale, ghost-like version of yourself or rely on conventional sunscreens full of questionable chemicals to get adequate sun protection. Sun protection shouldn’t be a chore or a drag in my opinion. Who has time or patience for that? The following sunscreens are not only safe, nontoxic and effective—they are easy and pleasant to use. Grab one or two and keep them ready for action. Plus, many of them are super portable and fit easily into a pocket or tiny bag, so there’s no excuse for getting caught in the sun without adequate protection. Sunscreen sticks are perfect for travel, so toss one in your tote and apply a quick swipe along the back of your hands or touch up your face as needed. These small sticks fit into the palm of your hand, and while they might not be practical for applying all over adults, they work great for covering little ones quickly and efficiently. The Babo Botanicals Clear Zinc Sport Stick SPF 30 is totally clear on skin as promised, and its creamy texture makes for a quick application. The Babo Botanicals Super Shield Sport Stick SPF 50 has a flat shape that helps it slide into a back pocket with ease and apply in a jiff. The higher SPF is nice for protecting very fair skin. Similarly, the Raw Elements Eco Stick SPF 30 and Raw Elements Eco Tint Stick SPF 30 offer nice coverage and a convenient applicator. I love the flat stick shape because you can cover more skin quickly. 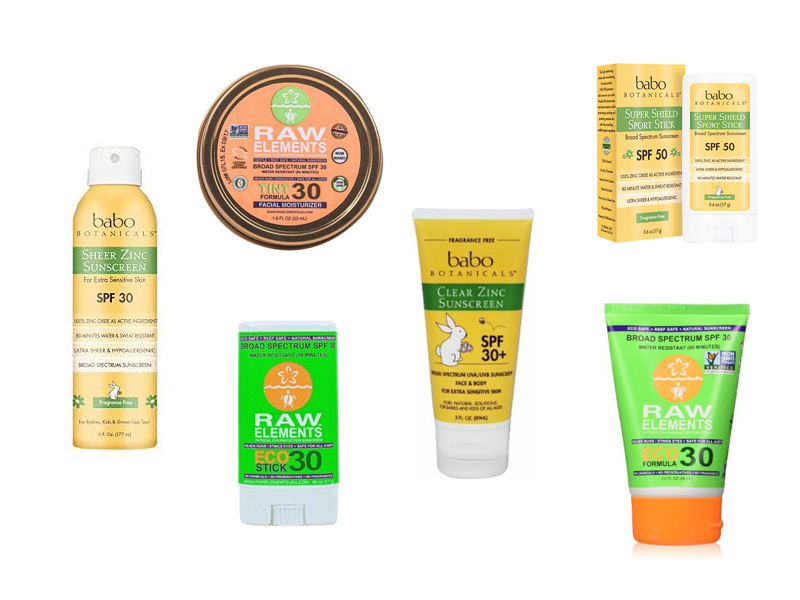 When it comes to sunscreen lotions, Babo Botanicals Clear Zinc Sunscreen SPF 30 is a top choice. It absorbs rapidly, disappears on skin and feels utterly weightless with no stickiness. It isn’t water resistant, so this may not be the best choice for water activities, but it’s fantastic for outdoors. The Babo Botanicals Sheer Zinc Continuous Spray Sunscreen SPF 30 is pretty revolutionary, too. It’s quick, convenient and light as air. The formula sprays on and leaves no residue to speak of. This would be perfect for squirmy kids who may not have the patience to be rubbed down with sunscreen lotion. For those active days when you’re in the water or sweating up a storm, the water resistant formulas by Raw Elements are a must have. No beach bag is complete without the Raw Elements Eco Formula SPF 30, which spreads easily and stays put. It’s also available in a recyclable tin, and the similarly packaged Raw Elements Tinted Facial Moisturizer SPF 30 has just enough color to help camouflage any hint of zinc while evening out your complexion. With all of these beautiful and practical options, this is the first summer in a while that I feel my mineral sunscreen needs have been adequately met. Whether I feel like using a stick, spray or lotion—I know I can count on these nontoxic SPFs to deliver protection and feel great on my skin.